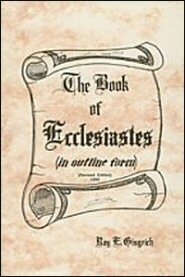 Ecclesiastes is one of “the five poetical books of the Old Testament.” It is also one of “the four wisdom books of the Old Testament.” Its depths have never been sounded and its interpretations are many and varied. It is a book difficult to exegete and understand but the central message of the book is clear and needs to be preached and taught today: the world (and its fullness) is vanity and vexation of spirit and real satisfaction and rest comes only from God. In his general introduction, Mr. Gingrich completely disarms his readers by acknowledging the fierce controversies concerning the book of Ecclesiastes. These controversies involve: (1) the name of the book; (2) the authorship of the book; (3) the date of the writing of the book; (4) the viewpoint of the author of the book; (5) the teaching of the book; (6) the purpose of the book; and (7) the inspiration of the book. Thus he creates an atmosphere in which his readers are eager and willing to listen to his solutions to the book’s problems, solutions arrived at through much study, diligent prayer, and trustful dependence upon the Holy Spirit. Then in his treatment of the text, Mr. Gingrich gives us, not only an analytical outline of the book, but also a satisfying exegesis of each section and verse of the book.